This is the word of the Lord concerning Israel. The Lord, Who stretches out the Heavens Who lays the foundations of the Earth, and Who forms the spirit of man within him declares, “I am going to make Jerusalem a cup that sends all the surrounding peoples reeling. Judah will be besieged as well as Jerusalem. On that day when all the nations of the earth are gathered against her I will make Jerusalem an immovable rock for all the nations. All who try to move it will injure themselves” (Zech 12:1-3). True, the ultimate fulfillment of this passage will come at the very end of the age, but a careful reading shows the progressive nature of the prophecy. First the surrounding nations will be sent reeling, with both Judah (West Bank) and Jerusalem besieged. Ultimately all the nations of the earth will be involved, and those who move against Jerusalem will wind up injuring themselves. And please don’t miss the way the Author identifies Himself: the One Who stretches out the heavens, lays the foundation of the earth and forms man’s spirit within him. Not much doubt as to Who’s speaking, so we better pay attention. It’s safe to say that all the nations of the earth are troubled over Jerusalem today. They realize the ease with which the whole world could be drawn into a conflict in the Middle East. And almost all are already aligned against Jerusalem. Remember, the prophecy is initially focused on the surrounding peoples and indicates that Judah and Jerusalem will be besieged. The degree to which this part of the prophecy is already being fulfilled is frightening. Much of the land bordering Israel has become little more than an armed camp, filled with troops at the ready. Hezbollah has been moving their rockets and missiles into position again with Lebanon’s full support, while steadily increasing their inventories of weaponry. Syria also has troops along Israel’s northern border as well as missiles set to fire upon Israeli cities. In the South Hamas and the PA are no less prepared. Recent reports confirm that large numbers of rockets and missiles from Libya have turned up in Gaza. Together, these next door neighbors claim that every city in Israel is now within missile range. In it’s headline report on Dec. 5, 2011 Debkafile assessed the likelihood of war in the Middle East, including an Israeli attack on Iran, to be very high between mid-December and mid-January. The US and Russia have both stationed powerful fleets in the Eastern Mediterranean against this possibility. There’s still time for diplomacy but for now no one believes a diplomatic solution will be forthcoming. As a result, this is beginning to look like a run-up to Psalm 83, a battle that’s never happened, but involves all of Israel’s next door neighbors in an effort to “destroy them as a nation, that the name of Israel be remembered no more” (Psalm 83:4). The Psalmist pleads with God to pursue Israel’s neighbors with His tempest and terrify them with His storm so they will perish in disgrace (Psalm 83:15-17). I believe his prayer will be answered because this outcome is necessary to set the stage for Ezekiel 38-39. We should also consider what could be a related prophecy from Isaiah 17. It was partially fulfilled in 732 BC when the Assyrians conquered Damascus (Aram). 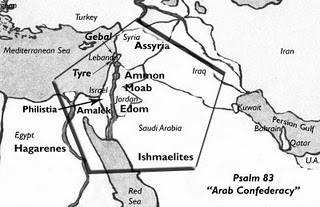 But never did Damascus cease to be inhabited as the prophecy requires (Isaiah 17:1). In fact to this day Damascus is described as the oldest continuously inhabited city in the world, over 5000 years and counting. The fortified city in vs. 3 was Samaria, capital of the Northern Kingdom of Israel. It was destroyed by the Assyrians in 722 BC. The Northern Kingdom consisted of the 10 tribes of Israel who rebelled in the religious upheaval that followed King Solomon’s death and was allied with Damascus against Assyria. Like Damascus it was defeated and its people carried off into captivity. Since Damascus was never destroyed and never ceased being inhabited, the world may have seen a partial fulfillment in history that points to a total fulfillment yet future to us. “For unto us a child is born, unto us a son is given. And the government will be on his shoulders. And He will be called Wonderful, Counselor, Mighty God, the Everlasting Father, the Prince of Peace” (Isa 9:6). The passage goes on to explain that He will sit on David’s throne and reign in peace forever. Only the first phrase of this passage has come to pass. The Child was born, the Son was given. The rest of the passage awaits His 2nd coming, but the fact that He was born confirms that the rest will take place as well. Partial fulfillment is the Lord’s way of validating End Times prophecies thousands of years in advance. The Oracle against Damascus is a lot like the one against Babylon in Isaiah 13-14, where Babylon is also described as being so totally destroyed that it would never be inhabited again. For many years scholars believed this prophecy was fulfilled when the Medes and Persians conquered Babylon about 535 BC. It took the Gulf War to show us that Saddam Hussein had spent billions re-building Babylon, and to realize that Babylon was never destroyed in the manner the Bible describes. It has in fact been occupied almost continuously since its construction 2700 years ago. The City of Babylon will play a major role in world events at the end of the age before its final and total destruction, foretold in Rev. 18. The mention of many nations in vs.12-14 would seem to include more than just Assyria. Regarding point 3 there was a temporary revival in the southern kingdom under King Hezekiah that spared Jerusalem from the Assyrians, but nowhere is a revival in the northern kingdom or among the Arameans (Damascus was the capital of Aram) or Assyrians mentioned in history. And yet in Isaiah 19:23-25 Assyria is mentioned with Egypt and Israel as being called “My people, My handiwork, and My inheritance” by God in the millennium. This reconciliation with God is still in the future. The USA and Europe have been warning Israel that an attack on Iran would not only result in a wider war in the Middle East, but would also deliver a severe blow to an already reeling world economy. Because of this US Secretary of Defense Leon Panetta recently said that Israel has to come to terms with a Nuclear Iran, an Islamized Middle East, and reliance on the US for protection. Israeli Prime Minister Netanyahu said sometimes making a risky decision carries a heavy price, but the price for not making it would be heavier. Reliable observers interpret this to mean when the time comes to attack Iran, whatever repercussions it could cause will not be considered in light of the threat to Israel’s continued existence. We’ll soon know whether that time has come.